INDIANAPOLIS, Wednesday, June 20, 2018 – The Indianapolis Motor Speedway Museum is pleased to announce that it has been awarded grants by the RPM Foundation and the Indianapolis 500 Oldtimer’s Club to fully fund an internship position in the Museum’s restoration department. 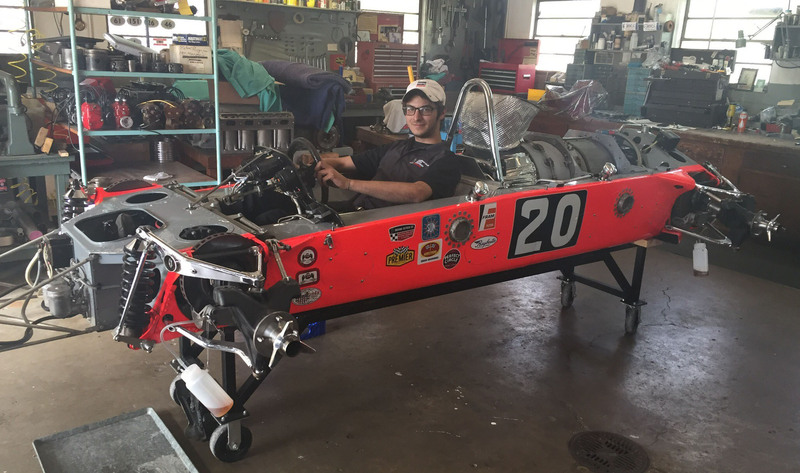 The $7,000 grant from RPM, plus a $5,000 grant from the Oldtimer’s Club, have made possible the hiring of IMS Museum 2018 summer intern Nicholas Martakis, a student at IUPUI (Indiana University-Purdue University at Indianapolis) and native of Valparaiso, Ind. Martakis is pursuing Bachelor of Science degrees in mechanical engineering and motorsports engineering. Not only is Martakis adding an extra set of hands during a busy summer schedule for the IMS Museum’s full-time restoration team, but he’s earning invaluable technical and practical experience, working on some of the racing industry’s most iconic vehicles. Martakis was instrumental in preparing the Museum’s vintage touring cars for the IPL 500 Festival Parade, in which the cars were used to carry the Indianapolis 500 drivers and their families. He also recently prepared the No. 20 STP Lotus 56/4 “wedge” turbine, which Art Pollard drove to a 13th-place finish in the 1968 “500,” for a trip to the Goodwood Festival of Speed in England. RPM Foundation (RPM) is an educational grant-making program of America’s Automotive Trust (AAT). RPM is funded by collector vehicle and classic boat enthusiasts to serve youth and young adults on their pathways to careers in automotive and marine restoration, and preservation, along with the long-term interests of the collector vehicle and classic boat communities. Visit www.rpm.foundation for more information.